You can migrate the contents of user mailboxes from an Exchange 2003 or Exchange 2007 email to Office 365 over time by using a staged migration. This article walks you through the tasks involved with for a staged email migration. What you need to know about a staged email migration to Office 365 gives you an overview of the migration process. When you're comfortable with the contents of that article, use this one to begin migrating mailboxes from one email system to another. For Windows PowerShell steps, see Use PowerShell to perform a staged migration to Office 365. Here are the tasks to do when you're ready to get started with your staged migration. Before you migrate mailboxes to Office 365 by using a staged migration, there are a few changes you must make first to your Exchange Server environment. You must use a certificate issued by a trusted certification authority (CA) with your Outlook Anywhere configuration. Outlook Anywhere can't be configured with a self-signed certificate. For more information, see How to configure SSL for Outlook Anywhere. (Optional) Verify that you can connect to your Exchange organization using Outlook Anywhere: Try one of the following methods to test your connection settings. Use Outlook from outside your corporate network to connect to your on-premises Exchange mailbox. Use the Microsoft Exchange Remote Connectivity Analyzer to test your connection settings. Use the Outlook Anywhere (RPC over HTTP) or Outlook Autodiscover tests. Wait for the connection to automatically be tested when you Connect Office 365 to your email system later in this procedure. Set permissions: The on-premises user account that you use to connect to your on-premises Exchange organization (also called the migration administrator) must have the necessary permissions to access the on-premises mailboxes that you want to migrate to Office 365. This user account is used when you Connect Office 365 to your email system later in this procedure. Be assigned the FullAccess permission for each on-premises mailbox and be assigned the WriteProperty permission to modify the TargetAddress property on the on-premises user accounts. Be assigned the Receive As permission on the on-premises mailbox database that stores user mailboxes, and the WriteProperty permission to modify the TargetAddress property on the on-premises user accounts. For instructions about how to set these permissions, see Assign Exchange permissions to migrate mailboxes to Office 365. Disable Unified Messaging (UM): If UM is turned on for the on-premises mailboxes you're migrating, turn off UM before migration. Turn on UM for the mailboxes after migration is complete. For how-to steps, see disable unified messaging. During the migration, the Simple Mail Transfer Protocol (SMTP) address of each on-premises mailbox is used to create the email address for a new Office 365 mailbox. To run a staged migration, the on-premises domain must be verified as a domain you own in your Office 365 organization. You must be a global admin in Office 365 to complete these steps. On the Manage domains page, click Add domain to start the domain wizard. On the Add a domain to Office 365 page, choose Specify a domain name and confirm ownership. Type the domain name (for example, Contoso.com) you use for your on-premises Exchange organization, and then choose Next. On the confirm that you own <your domain name> page, select your Domain Name System (DNS) hosting provider from the list or select General Instructions, if applicable. Follow the instructions provided for your DNS hosting provider. The TXT record usually is chosen to verify domain ownership. You can also find the TXT or MX value specific to your Office 365 tenant by following instructions in Gather the information you need to create Office 365 DNS records. After you add your TXT or MX record, wait about 15 minutes before proceeding to the next step. In the Office 365 domain wizard choose done, verify now, and you should see a verification page. Choose Finish. If you do not see the verification page, wait awhile, and try again. Do not continue to the next step in the domain wizard. You now have verified that you own the on-premises Exchange organization domain, and are ready to continue with an email migration. You use directory synchronization to create all the on-premises users in your Office 365 organization. You will need to license the users after they're created. You have 30 days to add licenses after the users are created. For steps to add licenses, see Complete post migration tasks. You can use either the Microsoft Azure Active Directory Synchronization Tool or the Microsoft Azure Active Directory Sync Services (AAD Sync) to synchronize and create your on-premises users in Office 365. After mailboxes are migrated to Office 365, you'll manage user accounts in your on-premises organization and they're synchronized with your Office 365 organization. For more information, see Directory Integration . After you identify the users whose on-premises mailboxes you want to migrate to Office 365, you'll use a comma separated value (CSV ) file to create a migration batch. Each row in the CSV file—used by Office 365 to run the migration—contains information about an on-premises mailbox. There isn't a limit for the number of mailboxes that you can migrate to Office 365 using a staged migration. The CSV file for a migration batch can contain a maximum of 2,000 rows. To migrate more than 2,000 mailboxes, create additional CSV files and use each file to create a new migration batch. The CSV file for a staged migration supports the following three attributes. Each row in the CSV file corresponds to a mailbox and must contain a value for each of these attributes. EmailAddress Specifies the primary SMTP email address, for example, pilarp@contoso.com, for on-premises mailboxes. Here's an example of the format for the CSV file. In this example, three on-premises mailboxes are migrated to Office 365. Each row under the header row represents one user and supplies the information that will be used to migrate the user's mailbox. The attribute values in each row must be in the same order as the attribute names in the header row. Use any text editor, or an application like Excel, to create the CSV file. Save the file as a .csv or .txt file. A migration endpoint contains the settings and credentials needed to connect the on-premises server that hosts the mailboxes you're migrating with Office 365. For a staged migration, you create an Outlook Anywhere migration endpoint. One migration endpoint is created to use for all of your migration batches. Choose More > Migration endpoints. On the Migration endpoints page, choose New . 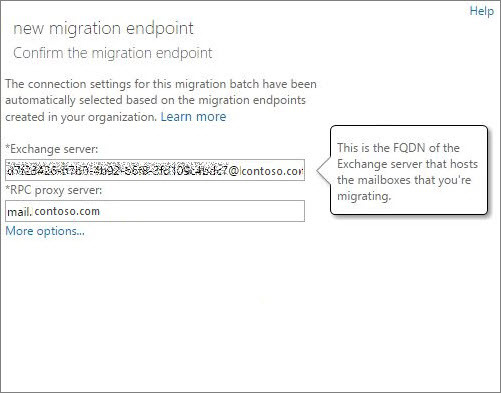 On the Select the migration endpoint type page, choose Outlook Anywhere > Next. Email address: Type the email address of any user in the on-premises Exchange organization that will be migrated. Office 365 will test the connectivity to this user's mailbox. Account with privileges: Type the username (domain\username format or an email address) for an account that has the necessary administrative permissions in the on-premises organization. Office 365 will use this account to detect the migration endpoint and to test the permissions assigned to this account by attempting to access the mailbox with the specified email address. Password of account with privileges: Type the password for the account with privileges that is the administrator account. If Office 365 successfully connects to the source server, the connection settings are displayed. Choose Next. Exchange server: Type the fully qualified domain name (FQDN) for the on-premises Exchange Server. This is the host name for your Mailbox server; for example, EXCH-SRV-01.corp.contoso.com. 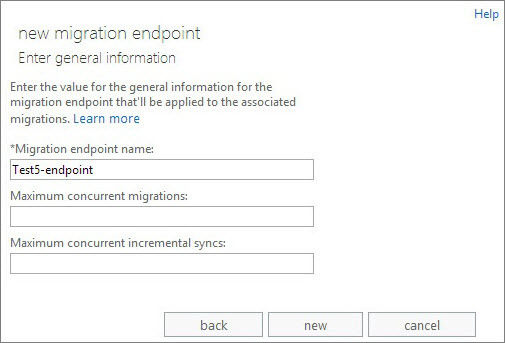 Choose New to create the migration endpoint. To validate your Exchange Online is connected to the on-premises server, you can run the command in Example 4 of Test-MigrationServerAvailability. You create and then run a migration batch to migrate mailboxes to Office 365. For a staged migration, you migrate mailboxes in batches—one batch for each CSV file you created. In the Exchange admin center, navigate to Recipients > Migration. Choose New > Migrate to Exchange Online. On the Select a migration type page, choose Staged migration > next. On the Select the users page, choose Browse and select the CSV file to use for this migration batch. It doesn't contain more than 2,000 rows. It includes the required EmailAddress column in the header row. All rows have the same number of columns as the header row. If any one of these checks fails, you'll get an error that describes the reason for the failure. At this point, you must fix any errors in the CSV file and resubmit it to create a migration batch. After the CSV file is validated, the number of users listed in the CSV file is displayed as the number of mailboxes to migrate. On the Confirm the migration endpoint page, verify the migration endpoint information that is listed and then choose next. On the Move configuration page, type the name (no spaces or special characters) of the migration batch, and then choose next. This name is displayed in the list of migration batches on the Migration page after you create the migration batch. Automatically start the batch: The migration batch is started as soon as you save the new migration batch. The batch starts with a status of Syncing. Manually start the batch later: The migration batch is created but not started. The status of the batch is set to Created. To start a migration batch, select it on the migration dashboard and then choose Start. Choose new to create the migration batch. The new migration batch is displayed on the migration dashboard. If you created a migration batch and configured it to be manually started, you can start it by using the Exchange Admin center. In the Exchange admin center, go to Recipients> Migration. On the migration dashboard, select the batch, and then choose Start. If a migration batch starts successfully, its status on the migration dashboard changes to Syncing. You'll be able to follow the sync status in the migration dashboard. If there is an issue, you can view a log file that gives you more information about the errors. You can also verify that the users get created in the Office 365 admin center as the migration proceeds. After you have successfully migrated a batch of mailboxes, you need some way to let users get to their mail. A user whose mailbox has been migrated now has both a mailbox on-premises and one in Office 365. Users who have a mailbox in Office 365 will stop receiving new mail in their on-premises mailbox. Because you are not done with your migrations, you are not yet ready to direct all users to Office 365 for their email. So what do you do for those people who have both? What you can do is change the on-premises mailboxes that you've already migrated to mail-enabled users. When you change from a mailbox to a mail-enabled user, you can direct the user to Office 365 for their email instead of going to their on-premises mailbox. Another important reason to convert on-premises mailboxes to mail-enabled users is to retain proxy addresses from the Exchange Online mailboxes by copying proxy addresses to the mail-enabled users. This lets you manage cloud-based users from your on-premises organization by using Active Directory. Also, if you decide to decommission your on-premises Exchange organization after all mailboxes are migrated to Exchange Online, the proxy addresses you've copied to the mail-enabled users will remain in your on-premises Active Directory. You can run batches simultaneously or one by one. Do what is convenient for your schedule and ability to help people as they complete their migration. Remember, each migration batch has a limit of 2,000 mailboxes. When you're done migrating everyone to Office 365, you'll be ready to start sending email directly to Office 365 and decommissioning your old email system. You don't need to do this task, but if you skip it, it might take longer for email to start showing up in the new Office 365 mailboxes. If you need some help configuring your DNS settings, go to our Create DNS records at any DNS hosting provider for Office 365. Email systems use a DNS record called an MX record to figure out where to deliver emails. During the email migration process, your MX record was pointing to your on-premises email system. Now that the email migration to Office 365 is complete for all of your users, it's time to point your MX record to Office 365. This helps ensure that incoming email is delivered to your Office 365mailboxes. Moving the MX record also let you turn off your old email system when you are ready. For many DNS providers, we have Create DNS records at any DNS hosting provider for Office 365. If your DNS provider isn't included, or you want to get a sense of the general directions, we've provided general MX record instructions as well. It can take up to 72 hours for the email systems of your customers and partners to recognize the changed MX record. Wait at least 72 hours before you proceed to the next task. All users in the batch are using their Office 365 mailboxes. After the batch is deleted, mail sent to mailboxes on the on-premises Exchange Server isn't copied to the corresponding Office 365 mailboxes. Office 365 mailboxes were synchronized at least once after mail began being sent directly to them. To do this, make sure that the value in the Last Synced Time box for the migration batch is more recent than when mail started being routed directly to Office 365 mailboxes. When you delete a staged migration batch, the migration service cleans up any records related to the migration batch and then deletes the migration batch. The batch is removed from the list of migration batches on the migration dashboard. On the migration dashboard, select the batch, and then choose Delete. It might take a few minutes for the batch to get deleted. Verify that the migration batch is no longer listed on the migration dashboard. After migrating mailboxes to Office 365, there are post-migration tasks that must be completed. Activate Office 365 user accounts for the migrated accounts by assigning licenses: If you don't assign a license, the mailbox is disabled when the grace period (30 days) ends. To assign a license in the Office 365 admin center, see Assign licenses to users in Office 365 for business. Create an Autodiscover DNS record so users can easily get to their mailboxes: After all on-premises mailboxes are migrated to Office 365, you can configure an Autodiscover DNS record for your Office 365 organization to enable users to easily connect to their new Office 365 mailboxes with Outlook and mobile clients. This new Autodiscover DNS record has to use the same namespace that you're using for your Office 365 organization. For example, if your cloud-based namespace is cloud.contoso.com, the Autodiscover DNS record you need to create is autodiscover.cloud.contoso.com. For more information, see Create DNS records for Office 365 when you manage your DNS records. Decommission on-premises Exchange servers: After you've verified that all email is being routed directly to the Office 365 mailboxes, have completed the migration, and no longer need to maintain your on-premises email organization, you can uninstall Exchange. Decommissioning Exchange can have unintended consequences. Before decommissioning your on-premises Exchange organization, we recommend that you contact Microsoft Support.